Berries Plastic Chair (Set of 6) Leg Finish: Powder Coated, Color: Yellow, Size: 8'' by Jonti-Craft at Indsight. Hurry! Limited time offer. Offer valid only while supplies last. 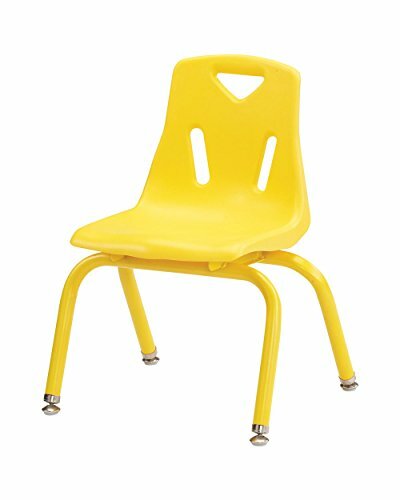 8118JC6007 Leg Finish: Powder Coated, Color: Yellow, Size: 8'' Features: -Set of 6 chairs. -Nylon glides reduce noise. -Child-friendly design. 8118JC6007 Leg Finish: Powder Coated, Color: Yellow, Size: 8" Features: -Set of 6 chairs. -Nylon glides reduce noise. -Child-friendly design. -Promotes seating comfort, durability and attractive styling. -Polypropylene shell is E-Z to clean, prevents blushing and dissipates annoying static electricity. -Non-exposed rivets prevent snags. Product Type: -Chair. Frame Material: -Metal. Seat & Back Material: -Metal/Plastic. Number of Items Included: -6. Stacking: -Yes. Leg Type: -Glides. Color : Yellow. Sold as set of six. Country Of Origin: Mexico. Warranty: 5 Years. Product Dimension: 16.5" D x 15.5" W x 17.5" H. Product Weight: 24 Lbs. Box Dimension: 33" L x 20.67" W x 17.13" H. Shipping Weight: 31 Lbs.